This article is about walnuts as food. For the genus, see Juglans. For other uses, see Walnut (disambiguation). California black walnut in growth. Technically a walnut is the seed of a drupe or drupaceous nut and thus not a true botanical nut. It is used for food after being processed, while green for pickled walnuts or after full ripening for its nutmeat. 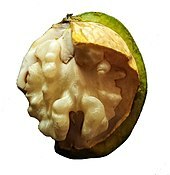 Nutmeat of the eastern black walnut from the Juglans nigra is less commercially available, as are butternut nutmeats from Juglans cinerea. The walnut is nutrient-dense with protein and essential fatty acids. The two most common major species of walnuts are grown for their seeds – the Persian or English walnut and the black walnut. 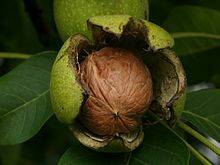 The English walnut (J. regia) originated in Persia, and the black walnut (J. nigra) is native to eastern North America. The black walnut is of high flavor, but due to its hard shell and poor hulling characteristics it is not grown commercially for nut production. Numerous walnut cultivars have been developed commercially, which are nearly all hybrids of the English walnut. Other species include J. californica, the California black walnut (often used as a root stock for commercial breeding of J. regia), J. cinerea (butternuts), and J. major, the Arizona walnut. Other sources list J. californica californica as native to southern California, and Juglans californica hindsii, or just J. hindsii, as native to northern California; in at least one case these are given as "geographic variants" instead of subspecies (Botanica). In 2016, worldwide production of walnuts (in shell) was 3.7 million tonnes, with China contributing 48% of the world total (table). Other major producers were (in the order of decreasing harvest): United States, Iran, Turkey, Mexico, Ukraine and Chile. The average worldwide walnut yield was about 3.5 tonnes per hectare in 2014. Eastern European countries had the highest yield, with Slovenia and Romania each harvesting about 19 tonnes per hectare. In 2014, the United States was the world's largest exporter of walnuts, followed by Turkey. The Central Valley of California produces 99 percent of total United States commerce in English walnuts. It has been introduced and been found naturalized in England. Walnuts, like other tree nuts, must be processed and stored properly. Poor storage makes walnuts susceptible to insect and fungal mold infestations; the latter produces aflatoxin – a potent carcinogen. A mold-infested walnut batch should be entirely discarded. The ideal temperature for longest possible storage of walnuts is in the −3 to 0 °C (27 to 32 °F) and low humidity – for industrial and home storage. However, such refrigeration technologies are unavailable in developing countries where walnuts are produced in large quantities; there, walnuts are best stored below 25 °C (77 °F) and low humidity. Temperatures above 30 °C (86 °F), and humidities above 70 percent can lead to rapid and high spoilage losses. Above 75 percent humidity threshold, fungal molds that release dangerous aflatoxin can form. 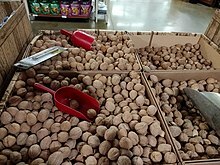 Walnuts in their shells available for sale in a supermarket in the United States. Walnut meats are available in two forms; in their shells or shelled. The meats may be whole, halved, or in smaller portions due to processing. Walnuts are often candied, and may be used as an ingredient in other foodstuffs. Pickled walnuts that are the whole fruit can be savory or sweet depending on the preserving solution. Walnut butters can be homemade or purchased in both raw and roasted forms. All walnuts can be eaten on their own (raw, toasted or pickled) or as part of a mix such as muesli, or as an ingredient of a dish. For example, walnut soup and walnut pie are prepared using walnuts as a main ingredient. Walnut Whip, coffee and walnut cake, and pickled walnuts are more examples. Walnut oil is available commercially and is chiefly used as a food ingredient particularly in salad dressings. It has a low smoke point, which limits its use for frying. Walnuts without shells are 4% water, 15% protein, 65% fat, and 14% carbohydrates, including 7% dietary fiber (table). In a 100-gram serving, walnuts provide 2,740 kilojoules (654 kcal) and rich content (more than 19% of the Daily Value or DV) of several dietary minerals, particularly manganese at 163% DV, and B vitamins (table). While English walnuts are the most commonly consumed, their nutrient density and profile are generally similar to those of black walnuts. In 2016, the US Food and Drug Administration (FDA) provided a Qualified Health Claim allowing products containing walnuts to state: "Supportive but not conclusive research shows that eating 1.5 ounces per day of walnuts, as part of a low saturated fat and low cholesterol diet and not resulting in increased caloric intake, may reduce the risk of coronary heart disease." The FDA had, in 2004, refused to authorize the claim that "Diets including walnuts can reduce the risk of heart disease" and had sent an FDA Warning Letter to Diamond Foods in 2010 stating there is "not sufficient evidence to identify a biologically active substance in walnuts that reduces the risk of coronary heart disease." Walnuts have been listed as one of the 38 substances used to prepare Bach flower remedies, a pseudomedicine promoted in folk medicine practices for its supposed effect on health. According to Cancer Research UK, "there is no scientific evidence to prove that flower remedies can control, cure or prevent any type of disease, including cancer". Walnut husks can be used to make a durable ink for writing and drawing. It is thought to have been used by artists including Leonardo da Vinci and Rembrandt. Walnut husk pigments are used as a brown dye for fabric as once applied in classical Rome and medieval Europe for dyeing hair. The United States Army once used ground walnut shells for the cleaning of aviation parts because of low cost and non-abrasive qualities. However, an investigation of a fatal Boeing CH-47 Chinook helicopter crash (September 11, 1982, in Mannheim, Germany) revealed that walnut grit clogged an oil port, leading to the accident and the discontinuation of walnut shells as a cleaning agent. Commercially, crushed walnut shells are still used outside of aviation for low-abrasive, less-toxic cleaning and blasting applications. A three-segment shell which occurs rarely. Walnut hulls contain polyphenols that stain hands and can cause skin irritation. Seven phenolic compounds, including ferulic acid, vanillic acid, coumaric acid, syringic acid, myricetin, and juglone were identified in walnut husks. Juglone, the predominant phenolic, was found in concentrations of 2-4% fresh weight. Walnuts also contain the ellagitannin pedunculagin. Regiolone has been isolated with juglone, betulinic acid and sitosterol from the stem bark of J. regia. Large, symmetrically shaped, and sometimes intricately carved walnuts are valued highly in China where they are rotated in the hand as a plaything, and used as an investment and status symbol, with some fetching tens of thousands of dollars. Pairs of walnuts are sometimes sold in their green husks for a form of gambling known as du qing pi. ^ a b c "Walnut; Agriculture – Transport Information Service". Association for German Insurance. 2010. Archived from the original on 2015-02-14. ^ "Commodity Profile: English Walnuts" (PDF). AgMRC, University of California. 2006. Archived (PDF) from the original on 2012-03-12. ^ a b c "Common Walnut Production Volume in 2016". Tridge. Retrieved July 3, 2018. ^ "Major Exporting Countries of Walnuts, 2014". Agri Exchange. 2015. Archived from the original on 2 October 2016. Retrieved 29 September 2016. ^ "California Walnut Industry". California Walnut Board. 2016. Archived from the original on 25 September 2016. Retrieved 29 September 2016. ^ "Food, Nutrition & Agriculture – Prevention of aflatoxin". FAO, United Nations. 1998. Archived from the original on 2011-03-07. ^ Forsberg, B.; Joan Clark-Warner, M.S.R.D.C.D.E. ; Beale, L. (2004). The Complete Idiot's Guide to Terrific Diabetic Meals. DK Publishing. p. 98. ISBN 978-1-61564-486-5. Archived from the original on March 31, 2018. Retrieved May 27, 2017. ^ "Walnut oil recipes". BBC. Archived from the original on 17 February 2014. Retrieved 3 July 2014. ^ Turner, Lisa. "Oil Change". Better Nutrition. Archived from the original on 6 July 2014. Retrieved 5 July 2014. ^ a b "Nutrition facts: Nuts, walnuts, English dried per 100 g". Condé Nast. Archived from the original on 5 July 2014. Retrieved 4 July 2014. ^ "Nutrition facts: Nuts, walnuts, black, dried per 100 g". Condé Nast. Archived from the original on 5 July 2014. Retrieved 4 July 2014. ^ "Qualified Claims About Cardiovascular Disease Risk: Walnuts & Heart Disease Docket No. 02P-0292". US Food and Drug Administration. 9 March 2004. Archived from the original on 27 October 2016. Retrieved 1 November 2016. ^ Laura M. Tarantino (9 March 2004). "Qualified Health Claims: Letter of Enforcement Discretion – Walnuts and Coronary Heart Disease (Docket No 02P-0292)". US Food and Drug Administration, Labeling and Nutrition. Archived from the original on 7 May 2017. Retrieved 30 April 2017. ^ D. S. Vohra (1 June 2004). Bach Flower Remedies: A Comprehensive Study. B. Jain Publishers. p. 3. ISBN 978-81-7021-271-3. Archived from the original on 31 December 2013. Retrieved 2 September 2013. ^ "Flower remedies". Cancer Research UK. 26 January 2015. Archived from the original on 11 September 2013. Retrieved 1 September 2013. ^ "Black Walnut Ink Workshop". Guild of Natural Science Illustrators. October 2002. Archived from the original on 9 October 2014. Retrieved 3 July 2014. ^ "The Colors of Invention – How to Dye Fibers Naturally". Smithsonian Museum. November 13–16, 1997. Archived from the original on 21 October 2014. Retrieved 3 July 2014. ^ Sherrow, Victoria (2006). Encyclopedia of Hair: A Cultural History. Greenwood Publishing Group. pp. 267, 355. ISBN 978-0-313-33145-9. Archived from the original on 26 November 2015. Retrieved 3 July 2014. ^ "In Re Air Crash Disaster at Mannheim Germany on 9/11/82. Ursula J. Schoenborn, As Executrix of the Estate of Leonedward Schoenborn, Deceased, v. the Boeing Company. Appeal of the Boeing Company. United States Court of Appeals, Third Circuit. 769 F.2d 115". Justia. 1985. Archived from the original on 17 May 2014. Retrieved 10 April 2014. ^ "OSHA fact sheet addresses abrasive blasting hazards". Retrieved 2018-08-20. ^ Cosmulescu, Sina Niculina; Trandafir, Ion; Achim, Gheorghe; Botu, Mihai; Baciu, Adrian; Gruia, Marius (15 June 2010). "Phenolics of Green Husk in Mature Walnut Fruits". Notulae Botanicae Horti Agrobotanici Cluj-Napoca. 38 (1): 53–56. doi:10.15835/nbha3814624 (inactive 2018-09-10). ISSN 1842-4309. Archived from the original on 29 July 2017. Retrieved 11 October 2016. ^ "Game of clones". Global Times. 16 October 2012. Archived from the original on 27 October 2012. ^ a b c d e f g h i j k l m n o p q r s "Walnut Cultivar Table". Fruit and Nut Information Center, Department of Plant Sciences, University of California, Davis. 2018. Archived from the original on 8 February 2018. Retrieved 6 March 2018. Ramos, David D. (1997). Walnut Production Manual. UCANR. ISBN 978-1-879906-27-3. Smith, Jane S. (2009). The Garden of Invention Luther Burbank and the Business of Breeding Plants. Penguin Books. ISBN 978-0-14-311689-9.